In his second collection, Passport, Richie McCaffery explores the realities faced by many international couples who live with the uncertainty of Brexit. The poems are taut with frustrated energy as the speaker, who it is clear from the poems is McCaffery himself, seeks a place to call home. McCaffery is British and his wife is from Belgium. They met at university in Scotland, but after years of further study, are living in Ghent. The poems are peripatetic. They hop between Northumbria, Scotland, and Belgium, and they also journey back to childhood as the poet tries to make sense of his present situation. He has moved to Ghent and ‘laid down all we have to be [t]here’, but it is also the place where his ‘life began / to come apart and fray’. Adjusting to a new country is difficult. The couple are bright, highly-educated, ambitious, hard-working and in love, but the poems are melancholic. While Brexit is not addressed directly, being married to a continental European in the current climate automatically creates uncertainty. Where should you plant your life if there is the possibility of you or your spouse being asked to leave? This is hinted at in ‘Roots’. in your country or mine. in time they’ll trip us up. McCaffery packs in some wonderful metaphors to sum up their situation. Life is ‘holding breath under the water’ (‘The Dippers’); life is ‘somewhere, somehow to be had’ (‘University’); ‘life’s a magic trick / the conjurer isn’t sure how to end’ (‘Postcard’). The emotional limbo of the speaker is highlighted by the liminal spaces the poems inhabit. The early mornings, empty rooms, and train stations emphasise the sense of rootlessness generated by moving between counties. but I’m thirty and they are announcing delays. I close my eyes and see my destination. The reality of moving to another country, even for love, is not romanticised. Living abroad can be deeply unsettling. Not understanding the language, differing cultural norms and the very fact of being seen as a foreigner can be draining. This is described in both serious and light-hearted ways. I go to the café over the road. The neighbours think he is Irish, which adds to the poet’s fluid, dream-like sense of being. In ‘Ish’, he writes, ‘my nationality grows on a grapevine’. Learning another language through the deep immersion of moving to a new country is like becoming a baby again. You have to start anew, listen carefully, and make funny sounds with your mouth and throat in the hopes of being understood. You become reliant on others. Feeling helpless as an adult who is seeking to find their place in the world takes a physical toll in ‘panic attacks…[and] /sweaty, sleepless nights’ (‘Kongostraat’). Adjusting to a new culture can sometimes feel like living in a strange unreality. In ‘Baudelopark’, the poet sits on a bench in the cold, observing the trees, buildings and trying to get a grip of himself. locked into a different channel. Work, and the anxiety of not working, is a strong theme in the collection. There are poems about writing, editing, academia, language teaching, and working in an archive. As a freelancer with a similar background, I enjoyed these poems and empathise with a life of graft. at seeing my own mistakes. I also loved the classroom poems. Here the poet finds himself with others who have come to Belgium, sometimes for very different reasons. There is a wonderful sense of community in these poems, which are unique to language schools, where so many disparate people come together. Despite the anxiety of the collection, the poet’s relationship with his wife is solid and mutual. They are each other’s ‘ballast,’ and the poems about her lift the collection into more hopeful realms. The sudden turning from despair to joy reminds me of Sonnet 29, when after listing his creative and professional frustrations, Shakespeare remembers his lover and feels such wealth that he would ‘scorn to change state with kings.’ In Passport, the poet’s wife is a continuous presence and there are many references to dinners, journeys and gifts. In ‘Delft tile’, the speaker tracks down a 17th century blue and white tile with a chevalier, which she treasures. In the same way, she gave him a ‘desert rose, a flower of rock / that’s bloomed for millions / of years in the most / inhospitable places’. He keeps it on his desk and it has been carried from house to house and country to country on their journey together. These gifts are beautifully symbolic of the sacrificial aspect of love. 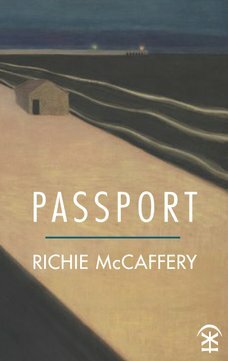 Richie McCaffery may eschew the notion of a soul (‘Marrakech’), but his second collection Passport is nothing if not soulful. These personal, story-like poems are full of tangible details: eye tests, second-hand bookshops, onions, honey, photographs and tiles. McCaffery writes: ‘I want to write something that will be / more important than any official document / relating to me (‘Nowhere’). In Passport, he does this, and does it well. You can buy Passport from Nine Arches Press. If you’d like to review for us or submit your publications for review, please contact Ali Lewis on ali@poetryschool.com or Will Barrett on will@poetryschool.com. Gravensteen, Ghent by Dimitris Kamaras. This image has been cropped and a filter applied. Licence.